Pantheon Books, New York, 2006. 227 pages. Available at Sembach Library (MCN F MCC). Reading another novel in the No. 1 Ladies’ Detective Agency series is like spending time with an old friend, a friend who likes to philosophize and drink bush tea. This book is very much like the others, so it’s not tremendously suspenseful or gripping, but you do feel you’ve been, as another title says, In the Company of Cheerful Ladies. What could be more pleasant? I’m still putting these books in the mystery category, because Precious Ramotswe does solve more puzzles. However, it’s a little more like reading a good story and watching the heroine solve a mystery than a more traditional mystery story where you can puzzle out the clues yourself. 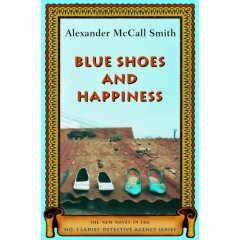 The mysteries are more incidental to showing us the characters of Mma Ramotswe and Mma Makutsi. In this book, there are some problems for Mma Makutsi and her fiancé. Will she continue to have bad luck with men? And will fancy blue shoes that are hard to walk in provide happiness in proportion to their price? Should Mma Ramotswe try to change her traditionally built figure to be a little less traditional? Copyright © 2006 Sondra Eklund. All rights reserved.